Welcome to Day 2 of the 7 days of EQResource Anniversary Contests! Todays theme is the Rain of Fear expansion. Please post in this thread to participate in day 1 of the contest! We want to hear what your favorite part of the Rain of Fear expansion was! Re: Day 2, Rain of Fear - 7 days of EQResource Anniversary Contests! Rain of Fear is one of my favorite expansions, probably top 3! The Beta for this expansion was unusually fun, for some reason. This is the expansion when I took over raid leading for a previous guild, Brotherhood of the Spider, and lead our guild to finishing RoF in first place on The Rathe server. I especially enjoyed the staggered content. In the end, it allowed for an expansion with much more content than the normal full release, once a year, cycle. I know many people did not like this staggered release cycle, however. RoF raids were some of the first that I attended when I came back to the game and joined Heroes on Luclin. I particularly enjoyed Velishan raids and having special spell sets saved for that encounter-after being told to keep my ice nukes to myself! RoF Hunter achiments bags are good incentive for me to go back and kill the all the names. Favorite thing has to be the clicks from raid currency. Specifically the delicious twincast clicks. Actually started doing these raids again to farm currency for them. During RoF I started from scratch with a wizard on Vox and managed to work from a new character with nothing into raiding with Pain and Glory. I'm back to playing Beastlord, but will always remember how fun it was to play the Wizard through and the friends I met while doing it. The best part of this expansion for me was finding the "hidden" Deepblade camp in Sep. West. I ground out tons of xp there preparing Bobsmith for raiding. My favorite part was the main hub of Shard's Landing with all the portals and easy access to the zones once you completed the attuning tasks. And of course finally obtaining Grelleth's Seal, even if it was well after the expansion was still in era it was still a glorious moment in EQ! Love the DE models, and taking them out. My "Oh s***!" moment was killing Roon or Shoon and finding a tower shield raid chase loot! Thought it was a mistake and looked over my shoulder out of fear someone was going to spirit it away. This was probably the last "great" expansion EQ received. While it had some recycled content, it was in places that made sense, with long questlines and strong themes. Each zone felt like its own compartmentalized story, while still fitting within the overarching narrative for the expansion. They also had distinct tiers and a (maybe somewhat overused) progressive gearing system that was easy to follow and didn't require extra combines or tradeskills, which is always nice for returning players. Oh and that raid content swoon. I still encourage guilds to hit RoF as a training ground at least once if they're brand new to the game. It's a great place to break a new raid force on mechanics. It's been neutered a bit at 110, and was already showing its age during EoK, but it's still not a terrible starting point for a group of newly minted raiders. It'll probably always hold a special place, for me, because it's where I picked up raiding after returning to Everquest on the Test server. If it wasn't for RoFs easy-to-follow difficulty curve, it's very likely Test would have never seen raids return to the server. They gave me a chance to learn the ropes as a raid leader and start to understand how modern-day EQ raids worked. We'll probably never see an expansion as solid as RoF, but at least it's still fun to go back and try this content at 110! Loved Raid of Fear and all the T1 zones with attunable items. Got many drops for guildies and have run many grouping events there where we gathered items and rolled on them all together for those who needed them. Was fun seeing Kael again too!. Shard's Landing arena alarans. Finished my Tear there on the Tablets at 1.5% drop rate. My favorite thing about RoF is how accessible it was to returning players at the time. I came back to regular servers during RoF, and was really lucky I did. Shard's Landing is the perfect "welcome to the expansion" zone, with easy quests and NPCs. I got a kick out of the chasm that leads to Sepulcher, that was awesome, and I also enjoyed the purple crystal being "fallen down" in there, and then being repaired as your server advances the expansion. The raid content was very challenging, I think the most times I've wiped on a raid in recent memory is the Chapterhouse event. The group content was excellent as well. It was a good experience for me as a returning player to do the explore tasks to "attune" the portals to each zone. It reminded me how beautiful this game is. I also really love the collectibles system. 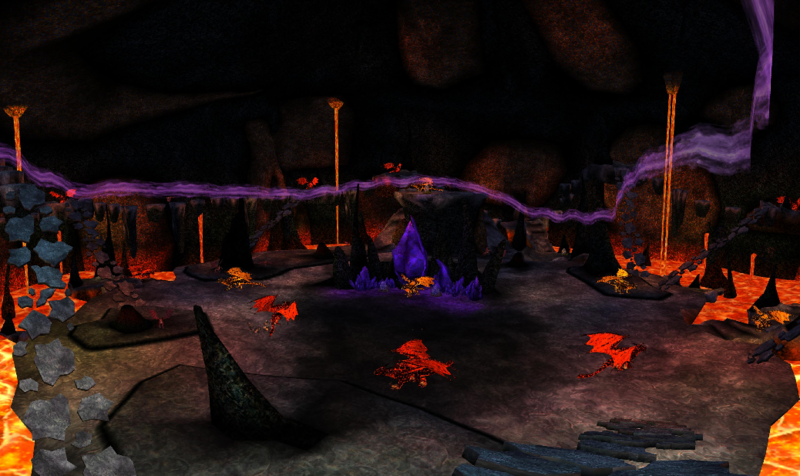 My favorite place in RoF is definitely the lava dragons room in Breeding Grounds. I was still on a break when RoF came out but quickly did all the tasks and missions when I returned. I loved all the purple (it's my favorite color). The zones were beautiful and I had a lot of fun maxing the stone of the landing aug. I missed this RoF content when I was on break, too. Of course, I missed everything. So, when I started working there for all things I need, it was so much fun and took a LOT of time to complete quests. I had to get help to completing quests, missions, and challengers. Not a lot of people realizes that you CAN obtain aug AND SL port ring clicky. There are three ways to get them: Complete Crystal Circle Builder quest, Challenger of the Heart of Fear (group challenger), or Vanquisher of the Heart of Fear... A lot of people got mindblown by this when I clicked both items. loved the quests had the feal of the older zones for me just at that new level. Love the raids except for Chapterhouse which caused issues for my guild trying to get to valley raids. The absolute best thing about Rain of Fear is the "Refurbished Puppet" Quest. You battle puppets in East Freeport! And, who does not like a pretty halfling in your entourage? Uh. Surprised nobody has mentioned the two hat achievs. Best. Graphics. Ever. Lot of good memories for RoF. The raid clickies that can be unlocked and Raid vendor bought after finishing the achievements! I really enjoyed raiding this expansion, but I also had a lot of fun doing group progression. Most of it I could do with my box team, and the rest I got done with some help from some friends. CC for sure for me. I loved the original Crystal Caverns during Velious, so being able to go back and do it again at a higher level was a great rush of so many fond memories from the old days.